Good bouldering across from the river from the Quarry, around Murderer's Bar rapids and the Mammoth Bar OHV area. Relatively new area, potential for projects, (a couple hard ones exist already!) and good established boulders. More in the moderate range i.e. : v2/3 to v6/7. Ethics: as a rule of thumb, boulder only here. A few exceptions have been made where very tall routes were bolted as sport climbs. From Auburn, take Highway 49 south to the Confluence, keeping straight on Old Foresthill Road (don't turn right to cross the bridge). Past the bridge, drive about a mile and a half to the Mammoth Bar OHV Area signed turn on the right. Drive downhill to one of the established dirt parking areas before reaching the entrance station at the bottom of the hill. Park up top (unless you have $10 for parking!) and walk down almost to the bottom; there is a pullout on the right with a sign that warns about the river rising rapidly. Trail goes past this sign, through trees and down to the river. As it flattens out at the bottom towards the river, the Shogun boulder will be on your left, hard to miss. Once at the water, head upstream to more boulders. For GPS coordinates of the typical parking area, click the map link from this page. See below pic for where it is. Easy approach from the Mammoth Bar OHV area. To get to some of the boulders and the roped area you have to do some boulder hopping/scrambling. Always be aware of the water level when at the Bar. Depending on the upstream release, which may take a few hours to get to the Bar, the water can rise very quickly and immediately below the bouldering is a rapid that will kill you if you get sucked in. Since I had this conversation with some climbers in Auburn Quarry/Cave Valley, I think it's worth mentioning here. 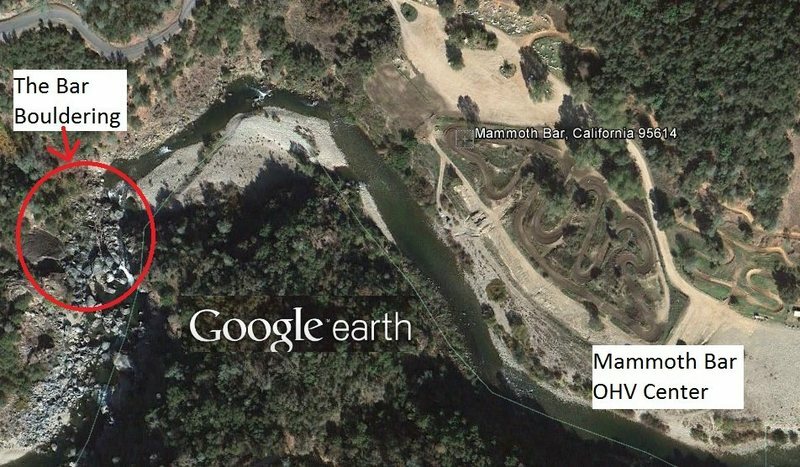 Mammoth Bar is another mile upstream from the Quarry climbing walls. It sounds like you can park at Mammoth Bar Off Highway Vehicle area. would anyone else agree that some TR bolts would be okay for the shogun boulder? i understand the highball thing but there are routes on the memorial wall at the cliffs that are shorter than this. the shogun thing looks rad!! great job. i cant wait to check it out and maybe try it :-/ there are a lot of other great problems there fro mas far back as the local seth carter? and then i think it was me and then charlie barrett did a great v7 roof and then vic copeland added a lot of new harder problems and got the mega classic v5 semi highball out in the water on a rock island. im glad this place is finally getting more appreciation. it is a cool spot. i did a lot of moderates there, some were probably new and some were probably done before me by seth i think and maybe a few others i had heard about. it would be cool to meet up there sometime and compare notes and boulder! Brian S, done. I just got my Cali admin wings here. I created the subareas for you, for each boulder, and transferred page ownership for the ones with your routes. B. The Quarry is more rope climbs, the Bar is primarily bouldering; even though it does have a couple rope climbs I think most would agree that bouldering is the main attraction here. C. I think it gets lost in the auburn cliffs section, by separating the two it would acknowledge the Bar as having its own distinct identity. Just a thought, The Bar has so much potential (in area that has so little good climbing) I think it could be time for it to come into its own. Totally agree on all points Sulli! The Bar is now its own destination.